Writing's On The Wall For Mayor? M@ Writing's On The Wall For Mayor? The artist...based the work on a photograph he took from the top of Canary Wharf. 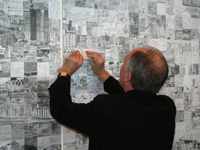 He divided the image into 1280 squares measuring three inches each. Members of the public were then invited to contribute a pencil drawing on an A4 paper based on a specific section of the picture. Contributors include Peter Blake, Norman Foster and Ken Livingstone himself. It's on free display until 10 April, when it leaves for a tour of hospitals. We suggest they also submit it to the handmade cartography pool on Flickr.